MI5 is being accused of a cover-up for failing to disclose to a parliamentary watchdog that it bugged the leader of the July 7 suicide bombers discussing the building of a bomb months before the London attacks. MI5 had secret tape recordings of Mohammad Sidique Khan, the gang leader, talking about how to build the device and then leave the country because there would be a lot of police activity. However, despite the recordings, MI5 allowed him to escape the net. Transcripts of the tapes were never shown to the parliamentary intelligence and security committee (ISC), which investigated the attacks. 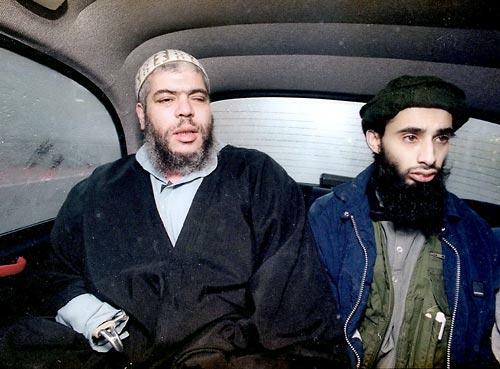 Haroon Aswat, the so called mastermind of the London bombings with Radical cleric Abu Hamza al Masri in a London cab on Jan. 20, 1999. Och svensken tror väl fortfarande på London 7/7 och New York 9/11 - snacka om ockuperade odemokratiska media. 911 AVSLÖJAT - SPRID SANNINGEN! DISKUTERA MED DINA VÄNNER!